Dental tourism a growing trend in the U.S.
Slick marketing campaigns and deals on luxury dental vacations are luring a growing number of Floridians to countries like Costa Rica for common procedures like root canals, dental implants and crowns, an ABC Action News review found. 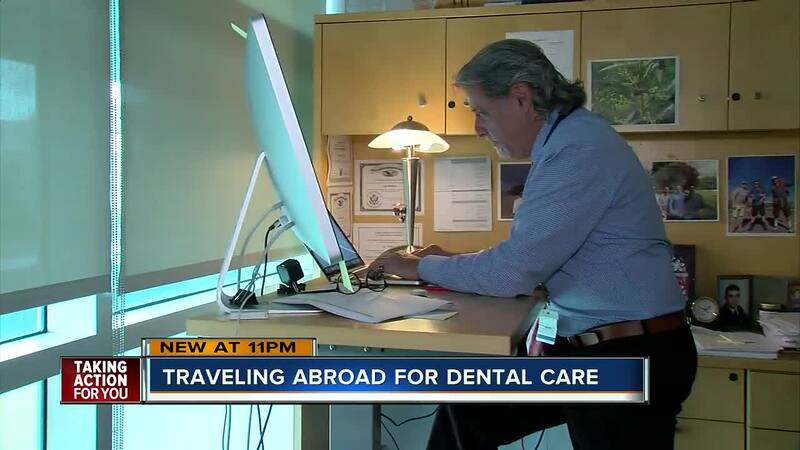 LAKELAND, Fla. — Slick marketing campaigns and deals on luxury dental vacations are luring a growing number of Floridians to countries like Costa Rica for common procedures like root canals, dental implants and crowns, an ABC Action News review found. About 85,000 Americans and Canadians traveled to Costa Rica for medical procedures in 2017. And 80 percent of those people were dental patients, according to Patients Without Borders. Expert say prices are driving the locals abroad. For example, implant-supported dentures cost patients about $1,500 in Costa Rica – less than half of the average $4,250 price tag in the U.S.
“Enjoy the beaches, have some fun, come back. You’ll be rested and have a new mouth," said Dr. Jay Wolfson, a health policy expert at the University of South Florida. Wolfson told ABC Action News Reporter Ryan Smith fewer insurance options in the United States are driving demand across the border but warned if something goes wrong abroad for patients abroad, their local dentist may not be able to help when they return home. “If I call my dentist in Tampa for work that was done in Costa Rica, he’s not going to touch it because then he becomes liable for anything that continues to go wrong,” said Wolfson. That may be why the American Medical Association is now urging doctors to be more compassionate with patients when they return home after botched procedures in other countries. Lakeland resident Melissa Conord-Morrow said she experienced constant, sharp pain on the left side of her mouth for years before she made the decision to travel to Costa Rica to have four teeth removed. Several area dentists and dental surgeons quoted her about $20,000 for the same procedures that cost $9,000 in Costa Rica, including the airfare for two visits to the Central American country and lodging at a bed and breakfast that caters to dental tourists. As a small business owner, Conord-Morrow said she can’t afford dental insurance as a small business owner and decided to travel abroad after a recommendation from a friend on social media. But Dr. Michael Diez of Tampa said he’s seen the dark side of dental work abroad. He showed ABC Action News an x-ray from a patient after a botched procedure in Cuba. That patient, who went to her home country to save money, now faces an even higher mountain of bills to fix what went wrong. “It’s very likely she will lose this tooth at some point,” said Diez. His father, Dr. Randall Diez, said he’s also treated many patients who received poor work abroad during his nearly three decades of dental practice. “If you are going in to meet a doctor for the first time in another country, good luck,” said Diez.